Wow, you are going to motivate me to train harder. I mean I can't drag a sled around the concrete jungle I call home (the big basin in AZ). However, I can switch up the intensity and weight in my packs etc. Nice routine, I hope you do well in the Susitna. Good on you. I have been playing similar games with Triathlon training. Most involving pain - swimming with paddles, long hard runs to work without any pretty mountains to look at - except far away ones. I am already hearing myself in Ullswater thinking, at least I don't have the paddles on. I think you're right on - this is JUST the kind of training you need for Su! 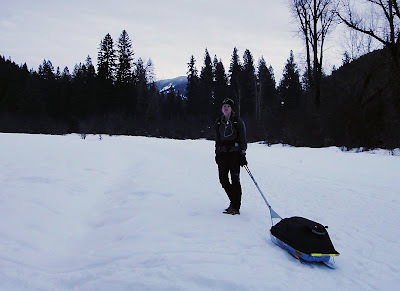 Dragging your sled in the dark in crappy snow is NOT fun. No doubt it's building mental fortitude! The tedium is one of the reasons that I have zero interest in doing this race - all of those frozen miles in the dark. Tedious. And hard. Yup, it's a really good thing you're preparing for that mental reality! All the more power to you! Go, Jill! Will be good to see you here again. Suspect you'll rock the walk on the Su100. Need any support on this end? I can't wait to see what you think of the Sustina on foot. I have the race marked as a "tentative" goal for next winter (bike), but I am afraid.